IHG Rewards Club has announced some new changes coming to the program. Most of it is good news, some of it is bad but the the bad news is easily avoided. Lets start with the bad news. IHG is implementing an expiry rule on the program. Just like Aeroplan, if your account doesn't have any activity for 12 months your points will expire unless you hold elite status in the program (which is relatively easy to earn!) That being said to keep your account active all you simply have to do is redeem for a digital music download for as little as 150 points. Really unless you have less points than that you shouldn't have to let your points expire. Now you do still have some time as the expiry rule doesn't kick in until May 16. The other sort of bad news comes in upcoming award night redemptions, on 1 May 2015, they will be changing the point requirements for Reward Nights at approximately 450 hotels. Less than 300 will be increasing by 5-10,000 points and 150 will be decreasing by 5,000 points. I guess this last tidbit is both good and bad. Onto the good news! IHG is introducing a new top tier elite level this July that can be reached by earning 75,000 qualifying points or staying at IHG hotels for 75 qualifying nights, over the course of a year. That level will have an industry first 100 percent extra bonus points on qualifying stays. Members of this newest level will also be able to choose between receiving 25,000 points or upgrading a friend or family member to Platinum. In addition to this addition to the elite levels IHG has restructured the qualification requirements for all membership levels to make it easier for members to be rewarded for their loyalty. Club members will need to earn just 10,000 qualifying points or stay for ten qualifying nights to be eligible for Gold membership. Gold members will need to earn 40,000 qualifying points or stay for 40 qualifying nights to reach Platinum membership. Finally IHG is enhancing its ability to learn about members and then utilize this information through a new Customer Relationship Management (CRM) system. This system will enable hotels to respond to members’ preferences at every stage of the guest journey and offer services and experiences that are personally relevant to them. From recognizing stay preferences such as room location or pillow type and tailoring their booking options, to relevant post stay offers. You can learn all about the changes here. We'd love to hear your comments about these changes to IHG Rewards Club as we know it is one of the most popular programs of Rewards Canada's readers. "Just received an offer from bmo for a new bmo airmiles elite world mastercard, or rather an offer to upgrade from the BMO Air Miles World MasterCard, for free for a year. Plus, the letter informed me that the 25% flight discount will only be available on airmiles flights in North America starting in may 2015! Guess it's a way to take the focus off the once again downgrated rewards program by offering a new card. it's time to use up the airmiles I have accumulated and look for a new travel rewards Program." We have reached out to BMO for confirmation but haven't heard anything back yet however I'm guessing this is correct and will be a major hit to the card by removing the "save 25% on Air Miles flights worldwide" feature. Granted I tend to believe the amount of flights that Air Miles members redeem for for travel outside of North America drops exponentially as the amount of miles you have to redeem for flights to Europe, Asia etc. are beyond what most members earn so the 25% off feature was probably not used very often for Internationl trips but would be a welcome discount if you could and did use it. There is still no mention of this change on the BMO site however. 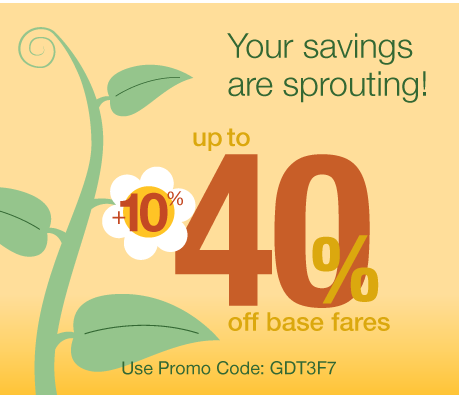 Porter Airlines is offering up to 50% off their flights if you book by April 16th for travel until August 24th! Find out more here. I received the same BMO offer in the mail. Bummer! Are you going to keep the card? Absolutely, I upgraded and am waiting for my new cards. The new card earns Air Miles at 1/$10 instead of 1/$15 so I will earn more Air Miles, and the annual fee is the same given that I was paying extra for the second card and now they are free. The 25% discount is not as important for me as you pointed out that international travel via Air Miles is already super costly. Looking forward to see when BMO updates their site with this card so we can see all the details! I'm surprised at the better earn rate given the changes in our credit card system but I guess that is a good thing!